3rd annual Ink Attack Tattoo Convention, three days of live tattooing and entertainment. Exhibiting nationally and internationally recognised artists. Open to the public on 11th 12th and 13th of August 2017 at the Surfair Hotel, Marcoola.Sunshine Coast. $1000 tattoo raffle prize up for grabs. 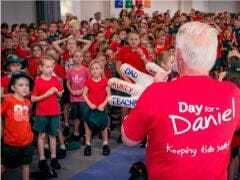 Proceeds from the raffle donated to the Daniel Morcombe Foundation.